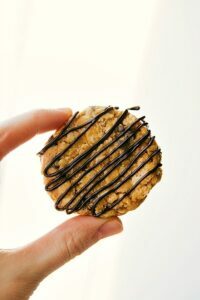 Only FOUR ingredients and a five-minute prep time to have these “chocolate-chip cookie” no bake energy bites. These bites are packed with protein and good-for-you ingredients! I’m a huge proponent of having healthy snacks around the house, and especially healthy snacks that taste indulgent like a dessert! These super simple and healthy energy bites are just the thing; They take minutes to whip together, they’re packed with protein (which will keep you fuller for longer), naturally sweetened with dates, soft, chewy, and so delicious!! 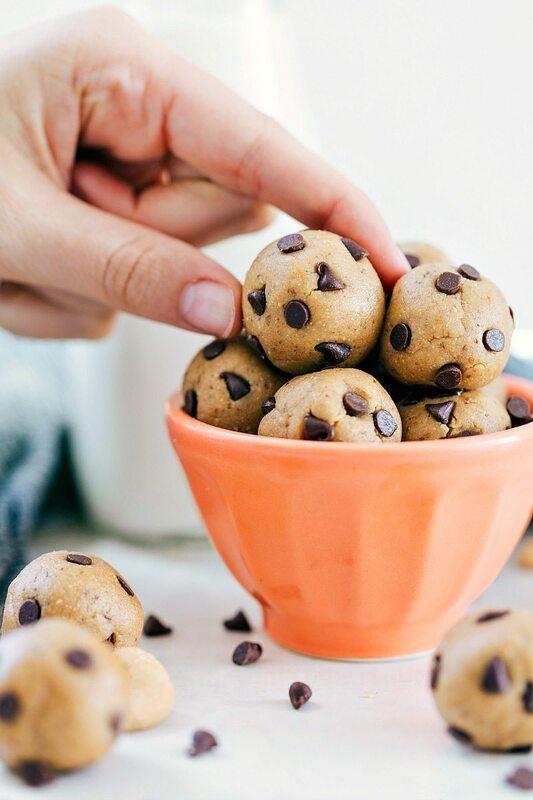 Since there are only four ingredients in these little cookie bites, the ingredients you use really matter! First up, the cashews. I buy roasted and salted cashews which have tons of flavor in them already. Roasting nuts gives them a ton of flavor and if you can skip that step (by buying pre-roasted) you’re well on your way to a delicious treat. 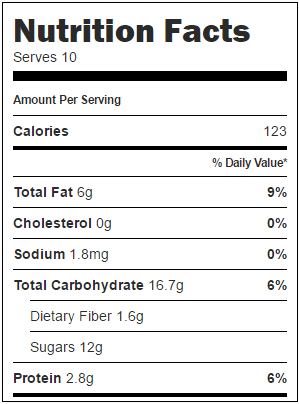 I also like the salted cashews because they have more flavor. 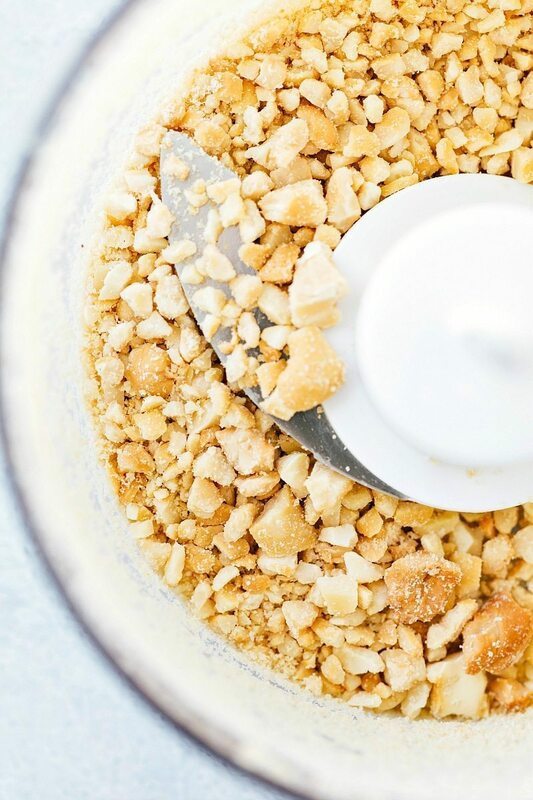 If you can’t find salted cashews though, no problem, just add in a pinch of salt to these balls! Next, the dates. If you’re skeptical about dates, let me tell you, you really can’t taste them in these (even with only 4 ingredients). The cashew and vanilla flavor are definitely over-powering and the date flavor is extremely subtle and mostly just gives these a touch of sweetness. For the dates, I like to use Deglet Noor made my Sunsweet — these are super simple to find and won’t have you searching various grocery stores for them. I’ve always been able to find these dates near the other dried fruits, trail mixes, and/or nuts in the store. Third, the vanilla. The vanilla is what gives these more of a cookie flavor. I like it strong in these bites and use a full teaspoon, but if you want a more subtle vanilla start with 1/4 to 1/2 teaspoon and add from there. You’ll want to use real vanilla and not the fake imitation vanilla for that good cookie flavor. Last, but not least, the miniature chocolate chips. 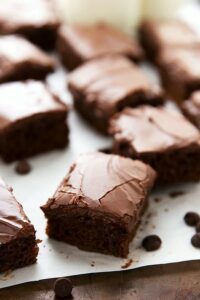 If you want to keep these super healthy and natural, use dark chocolate miniature chocolate chips or omit them entirely. Without the chocolate chips these taste less like cookie dough, but they are still really delicious! Only FOUR ingredients and a five-minute prep time to have these no bake "chocolate-chip cookie" energy bites. These bites are packed with protein and good-for-you ingredients! 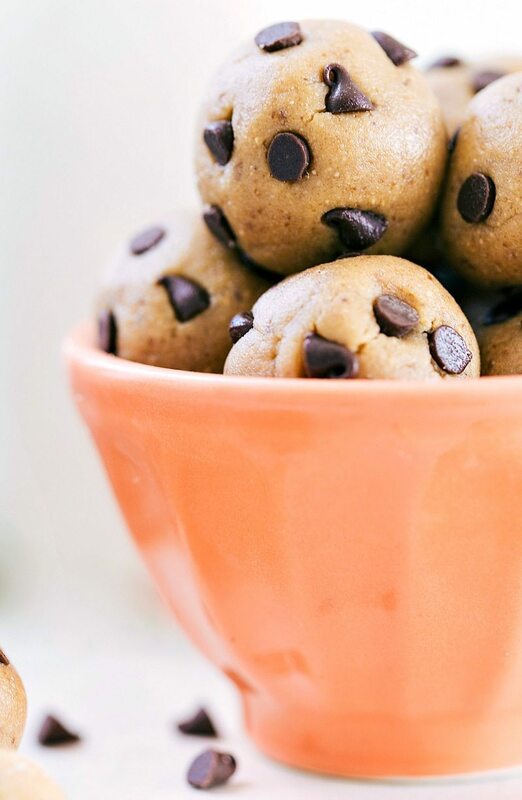 Optional: 1/4 cup miniature chocolate chips. 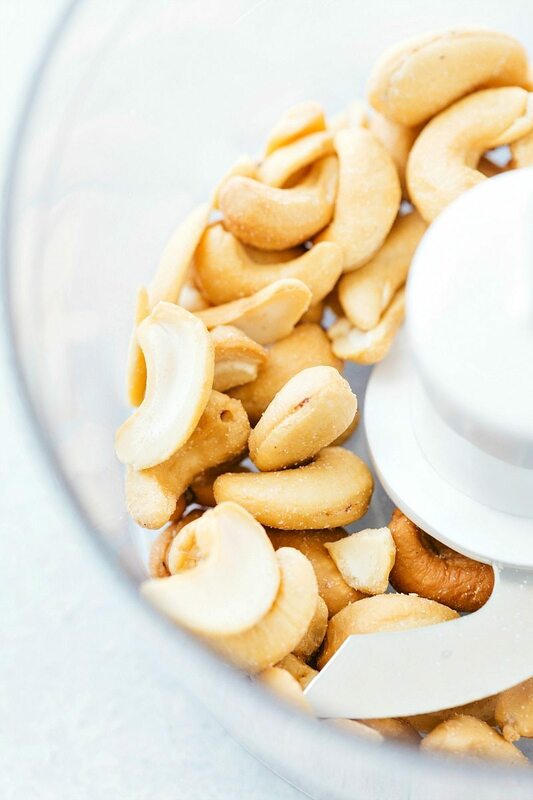 Add the cashews to a food processor (high powered) or a high powdered blender (I use twister jar on a Blendtec) and pulse until crumbly, but the cashews still have some good texture. Add in all of the dates an pulse until the mixture begins to turn into a thick dough. Add in the vanilla and pulse again until combined. Remove from the blender or food processor (you should have a thick and smooth "dough"). If desired gently stir in the chocolate chips cookies (make sure the "dough" is completely cool though (sometimes it heats up when being blended). Roll the "dough" into small bite-sized pieces. Transfer to an airtight container and store in the fridge. Snack on them pre or post workout or whenever you're craving a sweet treat or snack! *The dates should be soft (old and hard dates won't blend correctly). If they aren't soft, soak them in water for a few hours and then thoroughly dry. More Healthy Snacks around the web: Frozen Yogurt Blueberries, Frozen Chocolate Banana Yogurt Bark, and Blueberry Oatmeal Breakfast Bars. 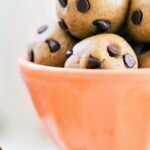 Healthy cookie balls? Yes please. These look amazing! I love the low prep for this healthy and tasty looking snack. Pinning for later!